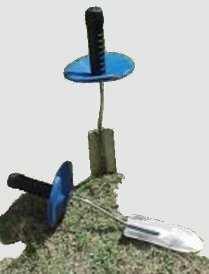 This demining hand tool was designed to meet the rules required to ensure that a tool does not separate or fragment in an anti-personnel mine blast. Thousands are in use in Humanitarian Demining around the world. The trowel blade and shaft are made using malleable stainless steel that extends through the handle to prevent separation in a blast. A long shaft makes it difficult for a deminer on his/her knees to dig vertically. The angled head and sharp sides make it a versatile scraper to remove spoil loosened using other tools. The blade is designed to take a powerful magnet-clip, so making the collection of ferrous fragments remarkably simple. separation. 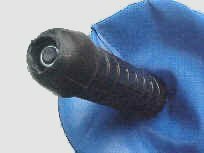 The user’s hand is protected by a pliant and washable ballistic aramid hand-guard. The guard does not prevent the use of a second hand to hold the blade, but is intended to discourage it. Open PDF data-sheet about using the SD Long trowel. See a PDF test report on the usefulness of this tool from the International Test & Evaluation Programme (ITEP) for humanitarian demining website. This is a lartge file including recorded test data, but the first 40 pages are recommended reading. Quote the SD Order No. SKU3012.